I’ve been making colour swatches – yes they are all completely hand made, each one the colours are chosen specifically for the group, and every time we print, colours change, so we have to move colours around from one colour group to another as they no longer fit where they were, but now fit somewhere new. Then they have to be put together by hand. It’s a hugely time consuming job, and not one that I can get anyone else to do. While I do the collating, I like to watch TED talks on my laptop, and so here is one that I really enjoyed this week. This week we’ve had some warm weather in Melbourne, so I’m moving mostly into my summer wardrobe, but with still a cool day here and there I need to have some sleeves and jackets. Love these leggings – they have a leather look front and are so comfy (similar to these). The shirt and jacket were from last season. Necklace from Bess Heitner jewellery, shoes are a trainer style like these. Jeans on again, with snakeskin belt for some pop. 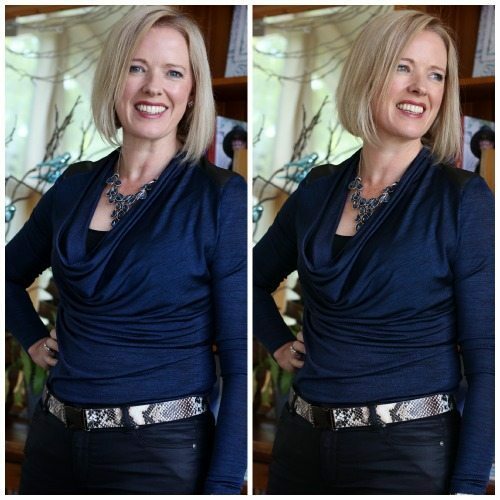 Top is a great navy that matches my eyes and has that bit of sheen that is in harmony with my skin. Who says jeans and a tee has to be dull, boring or unstylish? 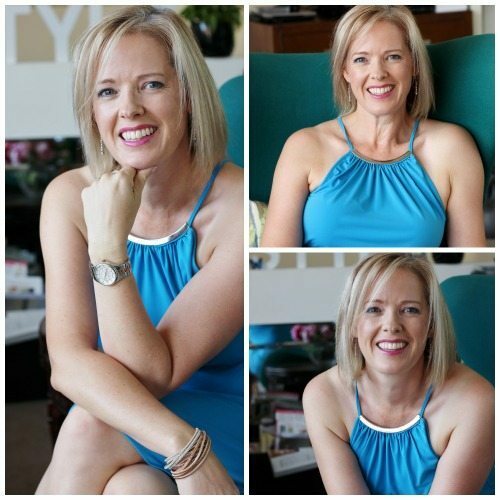 Hot day, so out came my Jane Lamerton dress from Myer with wrap bracelet . 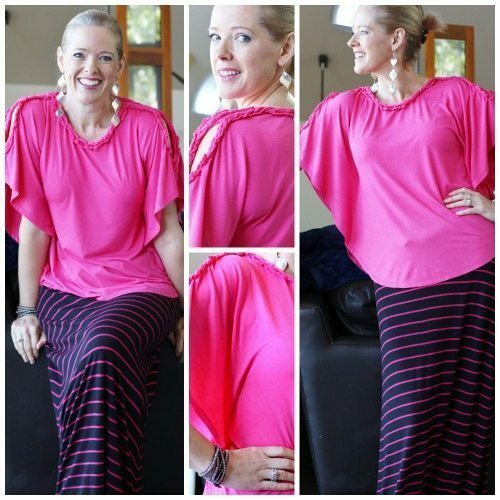 Decided to get out this maxi skirt (bought a few years ago from Target, here is a similar one) and team it with this hot pink top with a split sleeve. No need for a necklace but I did go for some oversized earrings that I got at Macy’s and a wrap Swarovski crystal bracelet and rings from Pandora. Today I’ve gone all curly hair – I use my VS Sassoon Curl Secret and it’s great – so easy to use! This gorgeous butterfly top I got from David Jones (Romance Was Born) and the skirt is from Target Australia, here is a similar one. I’m mixing patterns like a demon! I went out for dinner with a bunch of Nuffnang bloggers and it was cooling down, so I restyled my top with a pair of jeans (Calvin Klein straight leg, which fit my lack of booty well and have heaps of stretch so they are comfortable) with a silver belt from Witchery and a purple shrug. Cleo does love to photo bomb me! Will You Join Me in a Happiness Project? Dang, you get cuter all the time! Love all the different hairstyles, and LOVE you as a blonde. 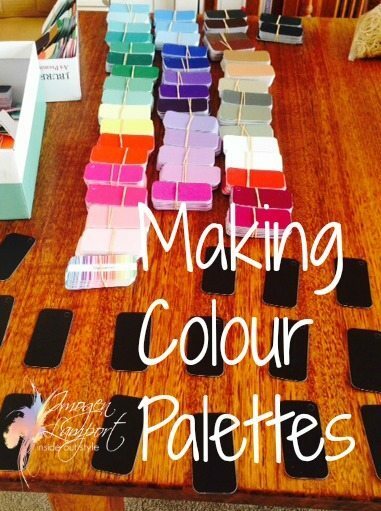 A while back, I asked whether you were going to do an E-book on colors and believe you mentioned it was in your future plans. Now that you have mentioned your color swatches, I was wondering if they would be part of the E-book on color so that your readers not able to visit you in person could benefit from your terrific color guides. 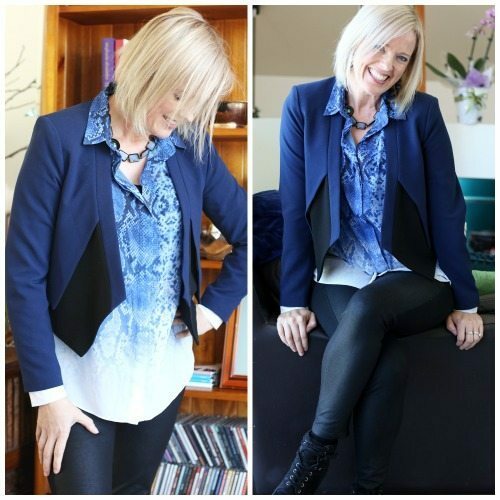 The top outfit with the GORGEOUS blue jacket and blouse underneath knocked me sideways. I love that look and it is stunning on you. You styled a week of outfits that are lovely and perfect for you coloring, shape, and style. Keep posting your outfits…I love seeing them. Now, where to find a jacket like that…. It’s from a smallish Australian label called Sass I think – looked to see if I could find anything like it to link to, but couldn’t sadly! I love the last look in particular, so unexpected! How is Cleo’s leg now? All good Sneza – so far – the cancer may grow back, we will wait and see! I will cross my fingers for her — she seems like such a sweet dog! Thanks!